Earth Law Center has partnered with Boulder Rights of Nature (BRON) and other local partners to establish the Boulder Creek Watershed as a legal entity possessing rights. Although ecologically and culturally important to the region, Boulder Creek and its watershed face many water quality and flow threats. To address these challenges, a local rights of nature law would permanently protect the Boulder Creek Watershed by establishing its fundamental rights, including a legal right to flow, to be free from pollution, to restoration, and others. It would also appoint legal guardians to enforce these rights. With Boulder’s long history of cutting-edge environmental protections, this new legal paradigm could serve as a model for other U.S. communities. A watershed is a geographic area in which water flows across the land and drains into a common outlet – such as a stream, river, lake, or ocean. Its area is defined by the continuous ridgelines that form its boundaries. [i] If you place a drop of water anywhere within a watershed, it will follow gravity downhill towards the same main body of water. A watershed includes all waterways, groundwater, land, and ecosystems therein. Protecting watersheds is important because they provide water for ecosystem and human needs. Clean, bountiful water with natural flow regimes is essential to thriving plant and animal communities. [ii] And humans rely upon healthy watersheds for drinking water, agriculture, recreation, and other uses. Without a healthy watershed, all of its inhabitants suffer. The Boulder Creek Watershed provides important habitat to numerous native fish species. These include creek chub, fathead minnows, green sunfish, longnose dace, longnose suckers and white suckers. However, many non-native species have also become established within the Boulder Creek Watershed, including a large population of brown trout. A broad range of other species live in the Boulder Creek Watershed, as well. Local mammal species include mule deer, coyotes, red foxes, yellow-bellied marmots, bobcats, and others. Boulder has a thriving bird population, as well, including the great horned owl and black-billed magpie, as well as warblers, tanagers, and towhees in the summertime. These are only a few examples this region’s incredibly diverse wildlife. For local communities, Boulder Creek and its tributaries are used for drinking water, irrigation, electricity generation, and recreation. [vii] As to the latter, hundreds of locals descend upon the Creek in July for “Tube To Work Day” – which is just one example of the community’s close connection to its waterways. Local residents frequently fish, hike, swim, and otherwise enjoy Boulder Creek and other local waters. 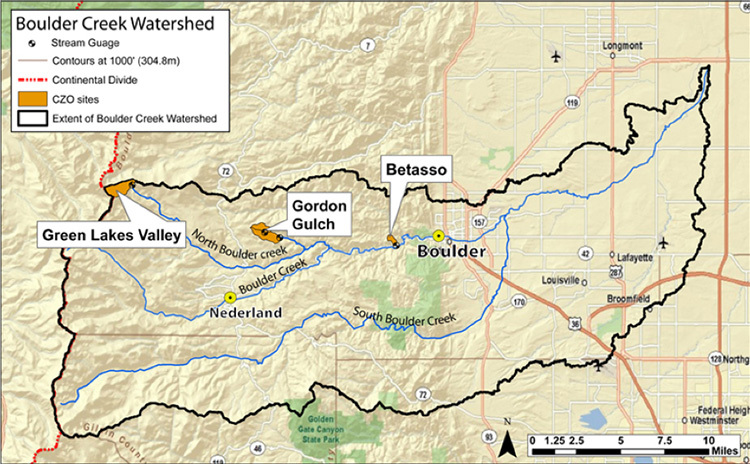 What Threats Does the Boulder Creek Watershed Face? Other threats to local waterways include low flows, high temperature, channelization, harmful dams, an altered flow regime, siltation, and more. While the Boulder Creek Watershed and its waters may appear pristine to visitors, they face many challenges – and these could become even worse as the population continues to grow. Background on Earth Law: What is it and Why is it Desirable? Earth Law, including Rights of Nature, is an ethical framework that recognizes nature’s right to exist, thrive and evolve – enabling nature to defend these rights in court, just like humans and corporations can. Earth Law also recognizes that humans and nature are co-members of a larger Earth Community, whose overarching well-being must be paramount. The Rights of Nature movement embodies the principle that natural communities and species are not merely property to be owned. Instead, they are living entities with certain inalienable legal rights. These rights are not “given” by humans, but rather are inherent to nature’s existence – just as humans possess inherent rights to life, liberty and the pursuit of happiness. Four rivers now enjoy rights recognition: the Whanganui River in New Zealand, the Atrato River in Colombia, the Villacabamba River in Ecuador and now the Colombian portion of the Amazon. Earth Law Center is firming up half-a-dozen new river initiatives to launch this year. In support of our campaign to establish rights for all rivers, ELC along with experts worldwide have developed a draft Universal Declaration of River Rights. The Declaration draws from victories for the rights of rivers worldwide, as well as scientific understandings of healthy river systems. Boulder Rights of Nature (BRON) in partnership with Earth Law Center and other local partners seeks legal rights for the Boulder Creek Watershed through a new local law. This would make it the first watershed in the United States to be recognized as a living entity possessing legal rights. Through this new legal paradigm, the Boulder Creek Watershed could be restored to health and permanently protected as a right, rather than its protection being dependent on the political and economic tides. Giving the watershed legal rights would not only benefit local ecosystems, but also humans that rely upon and enjoy Boulder Creek and its watershed. The law would also call for the appointment of one or more legal guardians of the Boulder Creek Watershed to oversee its rights and interests. These legal guardians would act on the watershed’s behalf in legal proceedings and ensure that it is fairly represented in the local democratic process. Boulder County and its residents understand the importance of protecting nature. After all, it has protected some 45,000 acres of open space. And with some 151 public trails, the local community has a very strong connection to its natural splendor. So will Boulder take the next step in its environmental protections by recognizing the rights of the Boulder Creek Watershed? If so, Boulder could become a model for other communities that wish to create new laws that protect nature as a partner on our shared planet, not as mere property. We look forward to seeing the benefits of this emerging paradigm in Boulder and across the world. Boulder Creek Rights of Nature is a leading advocate for nature’s rights in Boulder County. While successfully advocating for stronger environmental policies in Boulder County, BRON also launched a successful documentary series and host regular talks on local rights of nature issues. Earth Law Center is a member of BRON. Boulder Rights of Nature is working to get rights of nature established as law in one or more jurisdictions in Boulder County and elsewhere. [xvi] In this work, they are aligned with hundreds of community organizations across the country. (To see a draft of their ordinance, click here.) For example, BRON is researching legal frameworks to protect Boulder Creek and Coal Creek with their naturally occurring species. [i] Watershed Management.” Water Quality Monitoring Efforts, dep.wv.gov/WWE/watershed/Pages/watershed_management.aspx. [ii] “Watersheds 101.” The Nature Conservancy, May 2018, www.nature.org/ourinitiatives/regions/northamerica/unitedstates/indiana/journeywithnature/watersheds-101.xml. [xvi] “Boulder Rights of Nature - Establishing Legal Rights for Naturally Functioning Ecosystems and Native Species.” Boulder Rights of Nature, 2018, boulderrightsofnature.org/. [xvii] “Grassland Birds – Boulder Rights of Nature Film Series.” Boulder Dot Earth, “Watersheds 101.” The Nature Conservancy, May 2018, www.nature.org/ourinitiatives/regions/northamerica/unitedstates/indiana/journeywithnature/watersheds-101.xml.